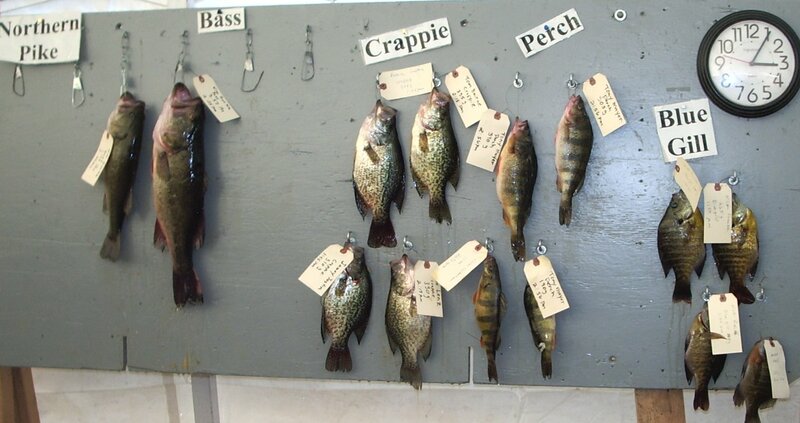 The BPCA held its 47th annual ice fishing derby on Saturday, February 3, 2007. Air temperatures of 3 below zero (F) combined with 20 knot west winds to make for a chilly afternoon on the ice, "just like old times", as one seasoned veteran was heard to comment. However, the cold weather didn't dampen the enthusiasm for this annual tradition! Derby headquarters for registration, prizes, games, refreshments, food, and fun was the big white tent pitched at the former Red Sails Resort on Brice Prairie, and packed to capacity. The ice fishing derby is an important fundraising event for the BPCA, with proceeds being used for BPCA conservation and community projects. In addition, it provides a pleasant social and community activity. Entry fees for prizes were $1 for adults or 50 cents for kids, with derby fishing closing at 3:00pm. Prizes for the top four fish in each category were: $25, $15, $10, and $5. Holmen Courier article: "Despite frigid temperatures, derby winner finds hot spot"